Mexican food in the U.S. has gotten much more specialized, as chefs experiment with unusual chilies, regional cooking styles and native ingredients that were previously unavailable. 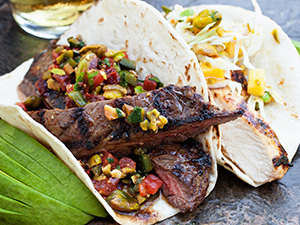 Chef Berryhill, originally from Texas and a pioneer in modern Southwestern cuisine, goes in a bold direction with these steak tacos. The smoky salsa gets its flavor from chipotles and roasted pistachios. Set salsa aside to cool. Pour mixture into a blender. Puree until smooth. Stir in pistachios. Refrigerate until serving time. Prepare marinade: In blender or food processor, combine mango, onion, garlic, jalapenos, tomatoes and rosemary; blend until smooth. Add oil; blend to incorporate. Generously brush meat all over with marinade; roll up each piece into a cylinder. Arrange rolled steaks in a shallow pan; pour on remaining marinade. Cover and refrigerate 24 hr. About 30 min. before cooking, remove meat from refrigerator. Preheat grill or broiler to very hot. Brush steaks with melted butter and season with BBQ spice, salt and pepper. Cook steaks just until seared, 3 to 4 min. per side for med.-rare. Transfer steak to a cutting board and allow to rest about 1 min. Slice across the grain into diagonal strips. Serve hot, with warm flour tortillas and Smoked Pistachio Salsa.